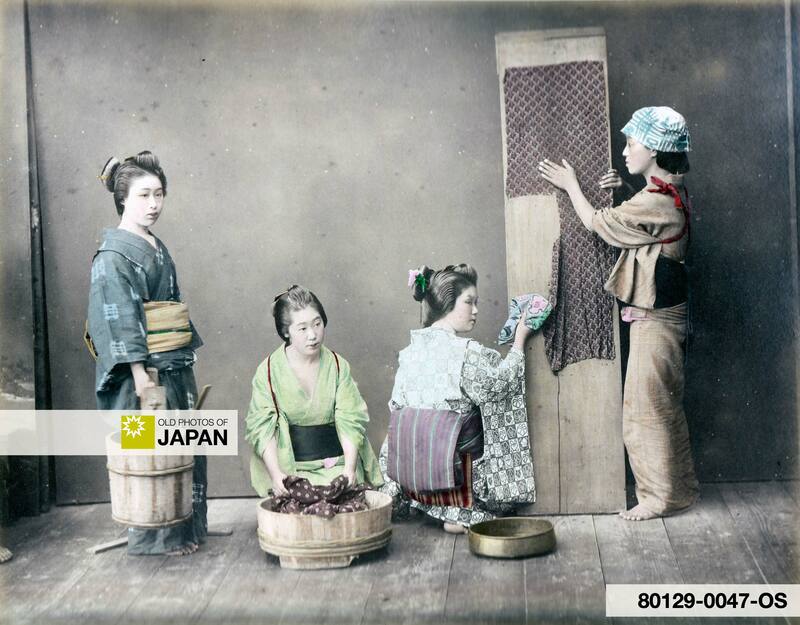 Another studio image portraying housework, in this case the washing of kimono. Some of the women have their sleeves pulled up with cords. In order to wash them, each kimono used be carefully taken apart. The unstitched pieces were than laboriously washed before being stretched on wooden boards for drying. Afterwards the kimono had to be re-sewn. This troublesome process was called araihari (洗い張り). Futon (bedding) were washed the same way. The drudgery of araihari must have weighed terribly heavily on the shoulders of Japan’s already overworked women. Additionally, araihari was not only awfully time-consuming, but it also required that kimonos were hand sewn, greatly increasing the cost. No wonder that kimono lost out to cheaper and more convenient Western clothing. These days, there are of course modern fabrics, dyes and cleaning methods. But it is too late, the kimono has already lost its central place in Japanese culture. 1 Lawson, Lady (1910). Highways and Homes of Japan. T. Fisher Unwin: 43. You can also licence this image online: 80129-0047 @ MeijiShowa.com.